This cabin offers the comforts of home, and more! The private hot tub overlooks the breathtaking view. The porch can be closed off, so your dog can enjoy the out doors while you are enjoying the hot tub and wonderful view! Dancing Bear has all the mountain air that you can take in! The breathtaking views of the mountains and the woods will soothe your spirit. Private and serene, you'll find sitting outdoors on the porch will be a favorite past-time during your visit. The kitchen is well equipped and bright and open to the dining area with lots of light from the big windows! The cozy living room has a wood burning fireplace and comfortable seating. The porch/deck has a grill, an inviting hot tub and 2 chairs to enjoy your breakfast, lunch or dinner while taking in the views! 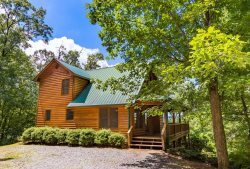 Dancing Bear is a wonderful cabin for a small family or two couples who want to get away from it all and enrich themselves with the beauty that Blue Ridge and the North Georgia Mountains have to offer. Easy to deal with...better than the large rental companies !!!! Very nice house. How clean everything was and terrific looking utensils!! Love to cook and many rentals have junk in the kitchen that I wouldnt use!!!!! The stay was great. Had a fire and got to see a bear.... REALLY CLOSE. It was leaning on the porch. That was exciting. Team was great professional and accommodating. Cabin was very nice. If the master bedroom mattress was updated we would definitely come back every year. I booked everything online, but all email correspondence was friendly, prompt, and informative - ensuring our stay went smoothly. We had an absolutely wonderful get away! The cabin is so cozy and makes you feel right at home. The porch is beautiful and has a gate, which is perfect for dogs. The view is even better and the house features large windows that allow the natural light to come in and view the scenery from inside, as well. Absolutely loved Dancing Bear cabin! Very friendly, welcoming, knowledgable, and helpful. Not as secluded as I would prefer. Other than that, really an excellent anniversary weekend.